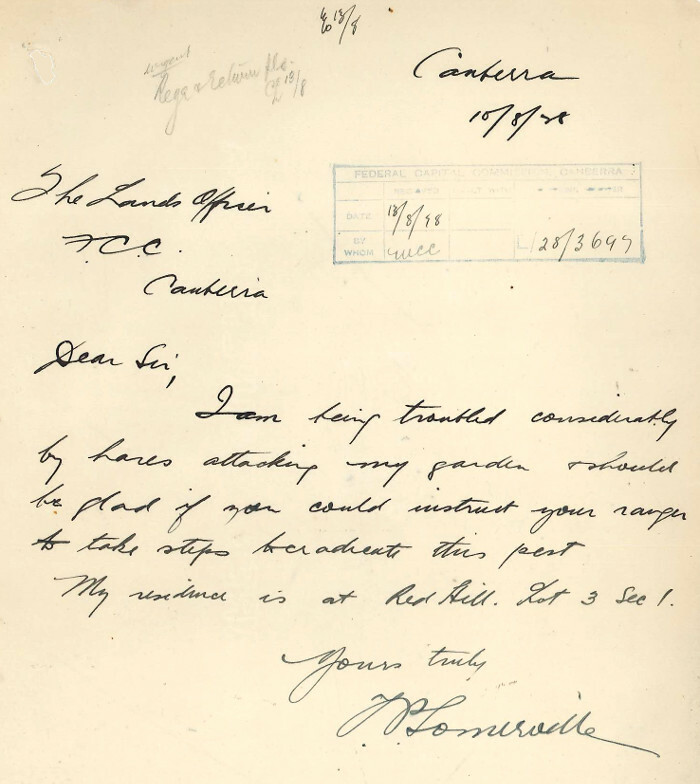 In June 1918, the Member for Eden-Monaro, Mr Austin Chapman, asked the House of Representatives, "Is it a fact that thousands of acres in the Federal Territory are at present unoccupied except by rabbits…?" In his question, Chapman failed to acknowledge that rabbits were not the only animal pest that Federal Capital Territory (FCT) lessees had to contend with. 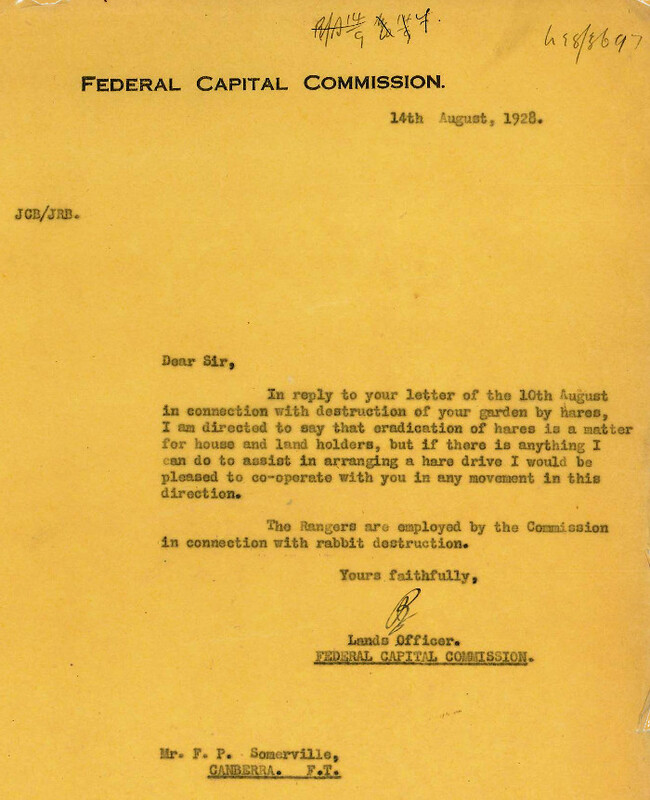 Although not specifically named within An Ordinance Relating to the Destruction of Rabbits and Noxious Animals in the Territory for the Seat of Government (No.6 of 1919), the Federal Capital Commission (FCC) classed a variety of animals and birds as "noxious animals". The Ordinance required that each pest had to be declared by the Minister by notice in the Gazette. Species on the noxious animal hit list included crows, eagle hawks and dingos (native or wild dogs), all of which proved to be a challenge to keep under control. Rural block lessees were frequently reminded of their responsibilities in relation to rabbits and other pests. Also, they were subjected to inspections by the Lands Officer and could be fined if the level of pest eradication was considered insufficient. However, it was the rabbit's cousin, the European Hare (Lepus europaeus), that was on the Canberra gardeners' hit list. 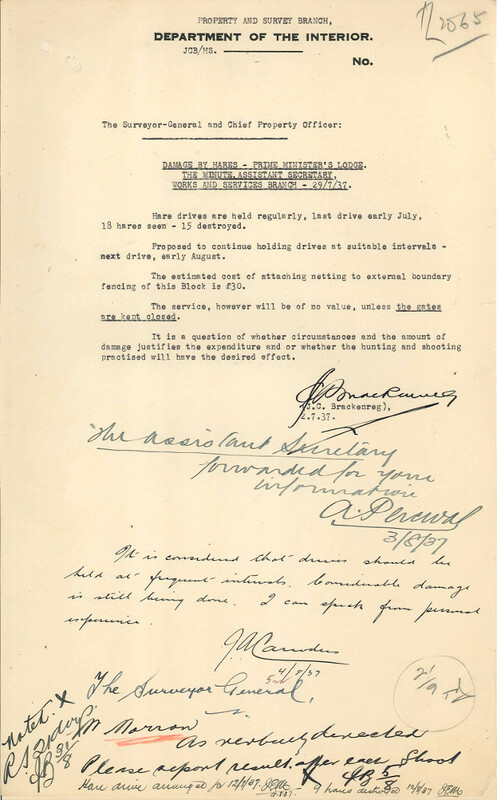 The file 'TL2065#01 - Destruction of Hares - ACT' highlights the damage hares caused to Canberra gardens during the 1920s to 1940s, as well as some of the control measures taken. 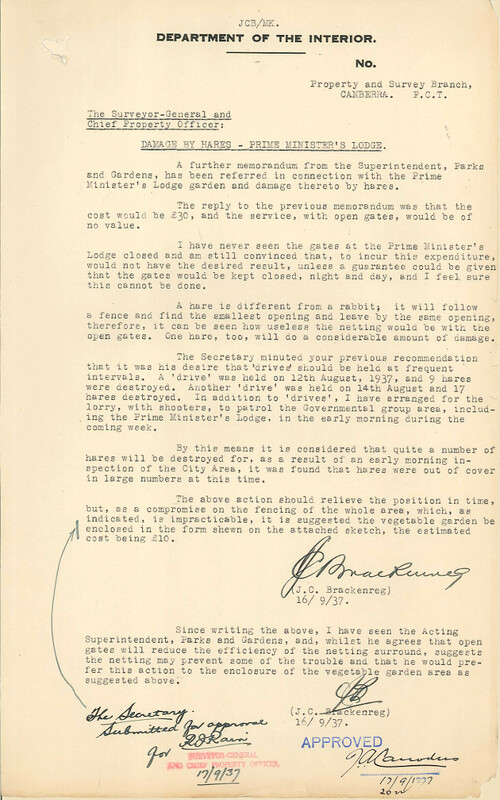 This file is ArchivesACT's Find of the Month. "If it lives, we want it"
During the mid 1800's, Acclimatisation Societies were formed across Australia. The concept originated in France with the grand ideal of enriching regions with flora and fauna from around the world. In Australia their goal was to introduce plants and animals, familiar to Europeans for the purposes of beautifying gardens, providing game animals for sport hunters and making land economically productive. The Acclimatisation Society of Victoria's motto was "If it lives, we want it". With that in mind, in 1862 they successfully introduced hares into Victoria. By 1870, hares had become widespread throughout the State, crossing into NSW in 1875 and reaching Queensland by 1900. Unlike rabbits, hares nest above ground and do not create burrows that can cause serious soil erosion problems. However, hares inflict significant damage to plants and trees, similar to that caused by rabbits. This is why hares are classified as a "pest animal". 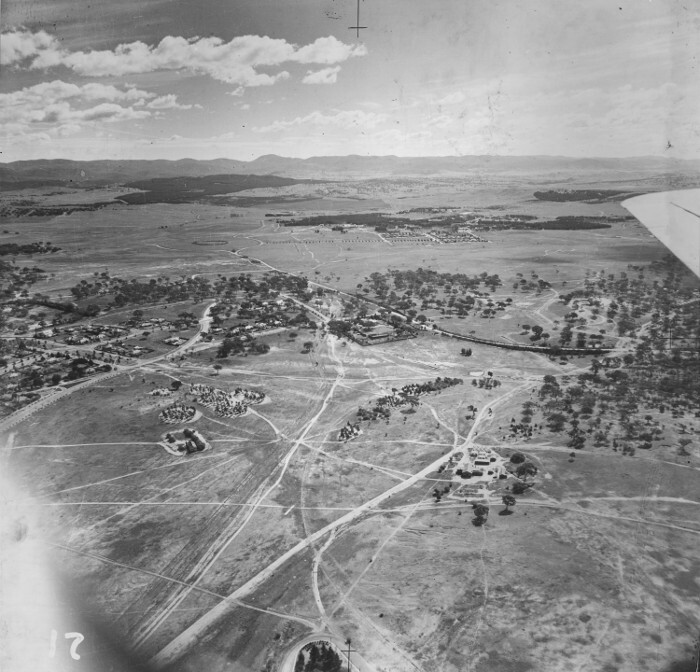 It is also this damage to 'The Garden City' that raised the ire of Canberrans. I am being troubled considerably by hares attacking my garden and should be glad if you could instruct your rangers to take steps to eradicate this pest. My residence is at Red Hill Lot 3 Sec 1. In reply to your letter of the 10th August in connection with destruction of your garden by hares, I am directed to say that eradication of hares is a matter for house and land holders, but if there is anything I can do to assist in arranging a hare drive I would be pleased to co-operate with you in any movement in this direction. The Rangers are employed by the Commission in connection with rabbit destruction. As hares reached plague proportions in the FCT by the 1930s, there were calls for the Department of the Interior to organise "hare drives" as a method of reducing their numbers. Beaters would flush the animals out of their hiding places and drive them towards a designated kill zone. Rangers would then dispatch the hares. "It is proposed therefore, to use a small army of beaters to drive the hares from their havens towards the foot of Black Mountain, where they will face a withering barrage from the guns of people who care to use up the Government ammunition that is to be supplied free of charge." The article finishes on a conspiratorial note by suggesting the whole exercise was a ploy to uncover unlicensed gun owners. "It was pointed out that a huge drive through the city area with rifles and guns would be a contravention of ordinances relating to the use of firearms and would constitute a danger to human life." During the remainder of the 1930s, the Department's Rangers did conduct regular small hare drives in a vain attempt to control their numbers. In July 1937, the Gardener in Charge at the Prime Minister's Lodge reported, "that considerable damage is being done to the garden by hares eating the young plants." At the time, The Lodge was on the southern edge of suburban Canberra with George Campbell's Yarra Glen property, a mere two kilometres away. The Parks & Gardens Superintendent, A.E. Bruce, suggested "That the Lands Department might assist in preventing this damage by organising a hare drive, or by fencing the area with wire-netting." As hares do not burrow, they tend to follow walls and fences until they find an opening. This makes netting a suitable deterrent to hares. "The estimated cost of attaching netting to external boundary fencing of this Block is £30. The service, however will be of no value, unless the gates are kept closed." 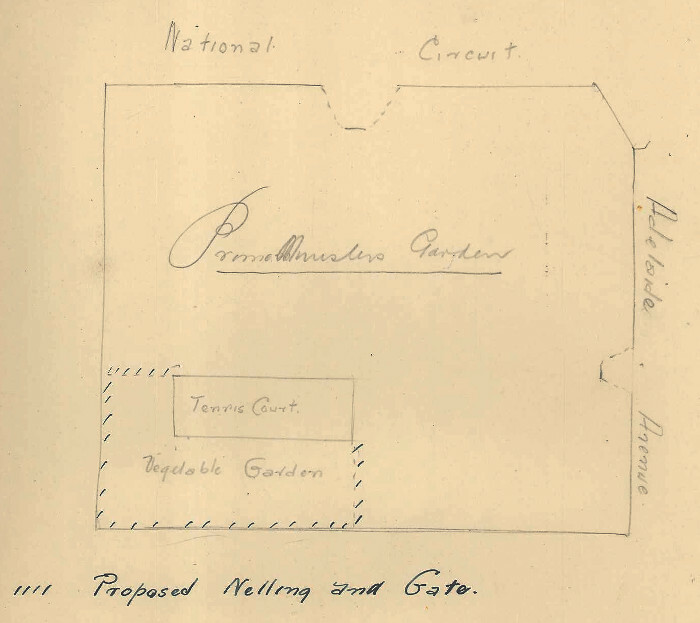 "I have never seen the gates at the Prime Minister's Lodge closed and am still convinced that, to incur this expenditure, would not have the desired result, unless a guarantee could be given that the gates would be kept closed, day and night, and I feel sure this cannot be done."